With a name derived from the 1977 hit song by Brick ("Dazz" or disco-jazz), Kinsman Dazz burst onto the scene in 1978 with their own brand of Ohio funk. Their first two albums, on 20th Century Fox Records, resulted in a couple minor hits and began to gather a small following for the group. In 1980 the group, then consisting of Bobby Harris, Mike Calhoun, Michael Wiley and his brother Isaac Wiley, singer/trumpeter Skip Martin, Eric Fearman, Ken Pettus, Kevin Frederick and Pierre DeMudd, shortened its name to The Dazz Band and signed with Motown Records. The Dazz Band's first two Motown albums didn't do much better than their earlier releases, hitting the middle of the R&B charts. But that all changed with 1982'sKeep It Live, a funkier, club friendly album that included the uber-infectious dance hit "Let It Whip." That single instantly turned the group into stars, topping the R&B and Dance charts and winning for The Dazz Band a Grammy for Best R&B Performance. It also began a half decade of chart strength, mostly consisting of upbeat hits that followed the template of "Let It Whip." "Joystick," "On the One for Fun" and "Let It All Blow" all hit the top ten and the accompanying albums were equally successful. By 1986, Calhoun was gone and the group's sound began to sound predictable and lose its appeal. Despite switching from Motown to to Geffen and then to RCA, as well as attempting to move to more of a rock feel in their music, the Dazz Band never again achieved the level of success they hit during the peak years of 1982-85. The group split for a period in the early 90s, but reunited for a couple albums on Intersound Records in 1997-8 (which barely charted) and independently released their last album, Time Traveller, in 2001. Calhoun, a prolific songwriter and guitar player, went on to sign with MCA Records and toured with the reggae band Identity. He then returned to Cleveland in 1992 to write and help produce an album for Cozette Morgan and, later in the decade, toured with The Travis Haddix Blues Band for two years. Calhoun then recorded two albums in the new millennium. In Blue was an project with elements of rock, funk, rap, jazz, blues and even a few gospel tunes that give tribute to his spiritual roots. He then released The One to positive reviews in 2009. In 2012, Calhoun brought back the Kinsman Dazz moniker and reissued In Blue. 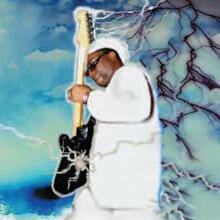 In 2013, Kinsman Dazz released the funk/jazz single, "Thang 4 U"